I woke up this morning and all I wanted to do was shovel. 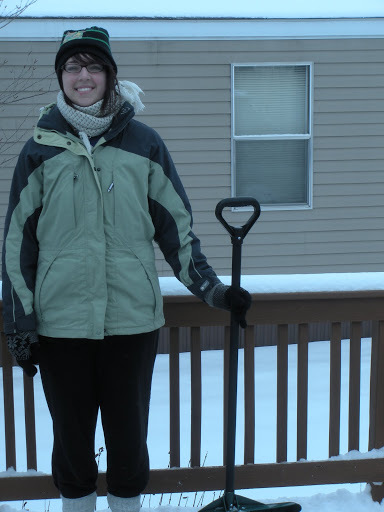 Shovel my deck, shovel my sidewalk, and shovel my driveway. For the sake of context, I’ll tell you that I grew up with four brothers. Four brothers that did most if not all of the shoveling growing up. I was required to shovel maybe once every couple years, and when I was required to shovel, I hated it. So why the sudden change of heart? I don’t know. Call it homeownership, I guess. But it sure was satisfying to be responsible for my own home. It will probably get old by tomorrow. Here’s another little-known fact about the writer of this blog: The power of suggestion is ten trillion times stronger for her. It’s what makes her so agreeable! I’m going to stop talking in the third person now. For this reason, I pretty much only read one blog (other than friends and family). And even on that blog, I pretty much only read one author’s posts. And, to my admission, I pretty much do everything she suggests. So, anyway, this is about my decision to line dry. Which basically means this is about Tsh’s suggestion to Line Dry. The smell! Oh, the smell! Seriously, I would rather have a freshly line dried shirt than a bouquet of flowers. Not even kidding you. 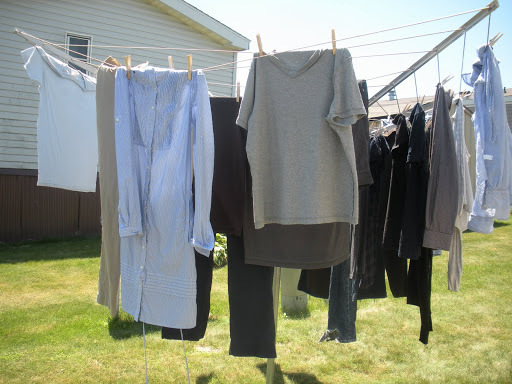 When I walk outside to pick our clothes off the clothes-line, I breathe deep. I think I love the smell even more because we’ve been using soap nuts to wash our clothes naturally. Because it’s natural, there’s no smell, which is a good thing. But there’s something about smell that convinces us of cleanliness, you know? I actually do care about the environment, but I probably care more about our budget. And we definitely save some dough by not using our dryer. Enough said. Laundry has a little more life to it. Knowing that it might rain that evening is good motivation to get our clean clothes off the line. Motivation is something that I need, considering I tend to leave our clothes in the dryer or unfolded until my husband decides to do something about it. With line drying, I have to deal with the laundry today. I love being outside, and I don’t get nearly enough of it. Therefore, if the only reason I go outside on any given day is to get my wonderful smelling laundry, I’m okay with that. I’ve promised some stories, and I’m not about to let July get away before I share them. One of the many things I love about our new home is that I have a gas-burning stove to cook our food on. I’ve never had a gas-burning stove and I’m definitely enjoying the difference it makes, albeit small. The one thing about a gas burning stove is that it’s actually directly connected to a gas line (I know, who would have thought?) thus increasing the risk of a gas leak. 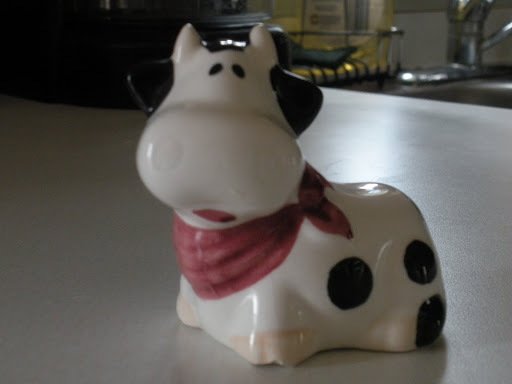 How could we possibly pass up a darling little porcelain cow that doubles as a salt shaker? Bryan made the obvious decision to pull the stove out further, so he could in turn fit his entire self behind the oven and retrieve the precious item. Yep, he ripped our gas hose. As I could smell the gas from across our trailer in another room, I became worried at the amount of gas that was pouring in our atmosphere. Bryan thought quickly to turn the gas off as I opened the windows. The next morning, we called Mid-American Energy to come and replace our hose and all was well. But our trailer smelled of those glorious gas fumes for a least a few days. The joys of owning a trailer! The best part of all of that, is that we received an adorable little cow salt shaker for the price of about $40 to replace our gas hose. You may ask, was it worth it? I have Gilmore Girls Season 5, disc 1 (from netflix) sitting on top of my entertainment center. Bryan and I have been watching Friday Night Lights Season 3 on Netflix Instant Watch. We watch LOST every Tuesday. We watch the Office and Parks & Recreation every week. I watch Project Runway every week. Bryan plays video games 4-6 days out of the week. We watch at least 2 movies a week. If ever we had an addiction as a family, this is it. Usually, when Simple Mom writes a new post, I feel like she’s writing it for me. This afternoon, as I read her blog about Make Week, I was sure she was writing for me. We need to cut some of this crap out of our lives. I talked to Bryan about it almost immediately when he got home. He totally agreed and we decided we would go all week without turning on our TV. Within an hour, we wanted to go back on our commitment. Pathetic, eh? We sat there, having no idea what to do, because we didn’t really feel like anything BUT watching TV. As we discussed our pathetic-ness, we discovered that we don’t know how to relax without the TV. Bryan didn’t want to read, I didn’t want to organize, we didn’t feel like going on a walk (on this perfectly gorgeous day). These are all perfectly relaxing things-but we wanted to veg! Thankfully, after sitting around staring at each other, we finally got up and did something. So far *this [make] week* we’ve been pretty productive. I finally made some adorable dividers for my mini management notebook (more on that later) which totally motivates me to use the cute dividers to open it up more and use it! 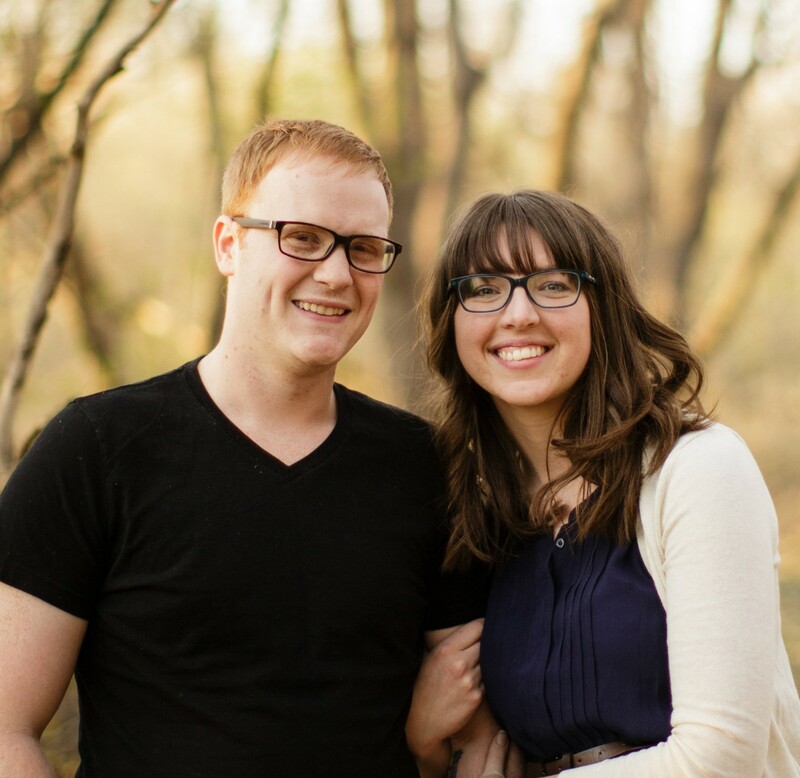 I’m blogging right now, and I’m going to menu plan these last two weeks of April as well tonight! And I’ll STILL get to bed before 11pm! Bryan mostly read Mere Christianity tonight and now he’s picking out healthy recipes. Well, I’m home for another snow day. I think I’ve had 5 snow days so far this winter-this weather is relentless! DONE and DONE! Hooray for productivity! *By the way, I’m so excited I just have to share! I’ve finally getting into a manageable work out routine! I worked out twice last week and once the week before. This week I’ll easily get to work out twice again. But the especially exciting news is that I’ve lost 6lb. in the last month! WOOHOO! I want to keep this trend going! I stumbled upon this amazing word when I was “designing” my daily to-do list. 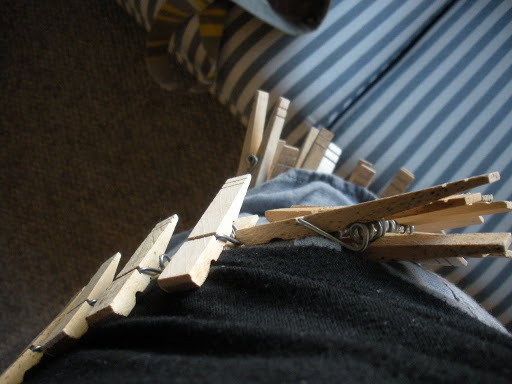 I was trying to think of something to inspire me to get things done, in a smart way. I thought of the word, “diligent” but I went to look it up to see if it really described what I needed to see everyday. diligent [dil-i-juh nt] – adj. 1. constant in effort to accomplish something; attentive and persistent in doing anything: a diligent student. 2. done or pursued with persevering attention; painstaking: a diligent search of the files. At first glance, it may look like my new goal is to be a busybody, I can see you’re point: She wants to constantly be doing things? On the contrary, I want constant accomplishments. This year, I don’t want to just get things done, I want all my work to reach toward a higher goal, an accomplishment if you will. While my tasks for the day may simply be making a meal, doing the laundry or organizing the bathroom cabinet, my accomplishment for the day is serving my husband. While another set of tasks may be to call an old friend, text a few high school kids, and hang out with my little sister, my accomplishment is encouraging people I love. What a beautiful mantra for my life! So that’s my theme for 2010! 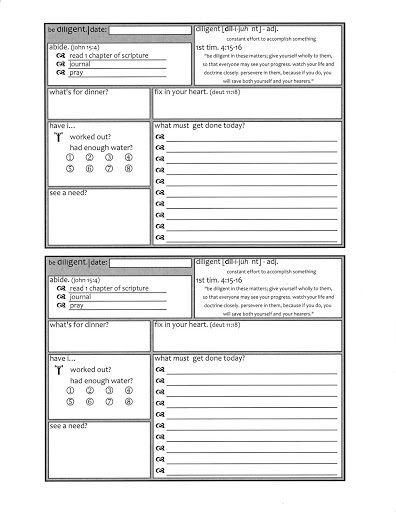 This is what my Daily Task List looks like, you can click the picture to view it full-size.